SAN JOSE, CA – In its only Bay Area stop, presented by CIRQUE DU SOLEIL at the SAP Center from March 28th through April 1st, its new show “CRYSTAL,” is a psychological-based story that transports the audience to the surreal world of a young girl’s mind, that we see represented on the stage with different places, and a building that appear to be constructed with perfectly assembled ice blocks of different forms and is constantly changing colors. Sliding in the ice, we see the Jugglers, juggling balls, and we also see a group of hockey players climbing a ramp skating at full speed, and jumping from one ramp to another. At the end, the group also tosses Crystal’s body horizontally on the air and catches her. Every act, in this show (because of the ice skates) is extremely difficult. At times, verging on what we believe is “impossible.” to do. Yet, those of us familiar with CIRQUE DU SOLEIL's spectacles, know that “doing the impossible” has been and continues to be CIRQUE’s trade mark .That trying something “different”, something never tried before is the reason why each one of CIRQUE’s shows stretches our imagination. 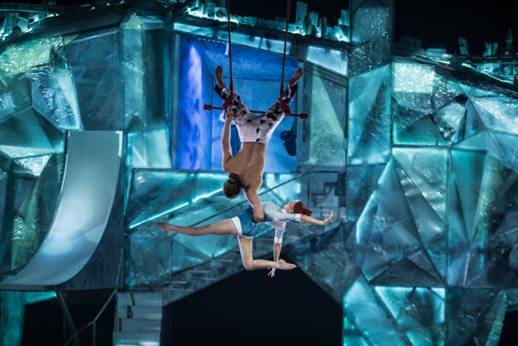 Analyzing the performances In CRYSTAL, we could say that every one of the artists participating on the show, including the aerialists, athletes and jugglers, know how to ice skate well enough to skate forward and backwards, run at full speed, jump from one ramp to another and dance. The performance is professional. Where “CRYSTAL” may needs improvement is in its story. It is much too complex to tell it to the the average Circus Audience, which include many children, without words. On opening night to the press. we could not even understand the words in the recording representing Crystal's thoughts, because the words came out garbled. The show starts when after falling through the ice, (A good visual effect) Crystal, (NOBAHAR DADUI) a young girl who tells the audience that she feels out of sync at home, at school, on the playground, on the street, and on the city, is swept into a swirling vortex of wind and snow as her imagination wonders in a free-fall. After her fall, Crystal is caught in a warped, exaggerated version of her life. After reflecting on her life, and chasing away her sad flashbacks,which include visits to her school playground, the ramps, the big city, the poles, the underwater world, the office, Courtship, and a ballroom to name a few. she returns to reflection, and she decides to take control of her environment. 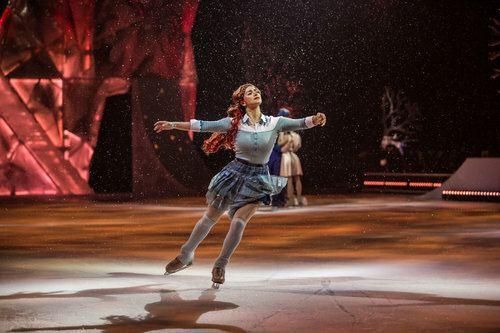 As she does, she catches sight of her Reflection (MADELINE STAMMEN – Solo Figure skater - USA) who makes her realize that real-life is above the surface, not in her make-believe world. After this realization and for the rest of the show, Crystal begins giving shape to the impulses of her soul. As presented, Crystal’s story delves too deep into psychology for even the adult audience to understand what is happening to her, without words. 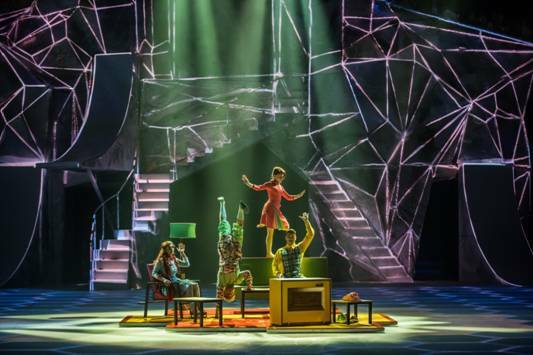 So, while the concept of a person struggling with her mind, may have sounded challenging, as it is presented on the stage in CRYSTAL the show, was not understood by the audience. Yet, even without knowing about minds and psychoanalysis to be able to fully understand the story, the audience enjoyed CRYSTAL as an spectacle it is. We all agree that the presentation of he story, was magical, and that every one of the artists presented in the show is a star.